However, all too often, many allow their fears, doubts and discouraging self-talk to build an impenetrable wall against achieving them. And then their dreams become longing wishes rather than thrilling expectations – all because their negative thought processes are discharging more negative energy than good feelings about what they want. As a result, they hold back rather than move forward. Having negative thoughts and feelings about what you want create negative emotions in the present moment about achieving them – and only now is when you have any power to move towards your dreams. Do you really want to go after something you feel negative about? That’s a hard thing to do. And it’s the reason why most people don’t. As a result of this low grade energy, you won’t have the motivation now to move towards what you want. And then, like so many shelved dreams, you’ll put them off. Yes, you want your dreams to manifest, but to realize them you also have to feel good about going after them. You need that get-up-and-go feeling. So the key to achieving any goal is to feel good about moving towards it. Your dreams will then transmute into a plan and become a mission to fulfill. It’s the energy behind your goals that determines whether or not you will go after them. And this energy is evoked by how you feel about them. It’s all in your mind. In your power. 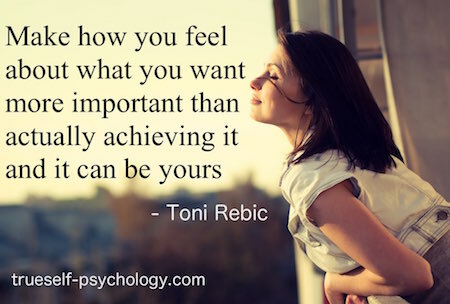 Make how you feel about what you want more important than actually achieving it and it can be yours. Feel good about your dreams, then sit down and begin writing a plan for their attainment. Use the momentum of now to take some action towards them. The more you act on that momentum – that driving energy – the closer you get to what you want. Love your trueself and build the energy for your dreams.